Lake Forest is one of four harbors on the shore of Lake Michigan between Chicago and Wisconsin. The small harbor (located in Forest Beach Park) has docks and boat ramps, but no moorings or permanent slips. The harbor is home to the dry sail fleet of the Lake Forest Yacht Club (LFYC). Dry sailing refers to the storage of small to moderately sized sailboats out of the water with means for transferring them between a boat compound and the water. The LFYC fleet resides in a sailboat-only compound adjacent to the harbor. The sailboats are kept on trailers which are towed between their place in the compound and one of two boat cranes via an electric mule that is shared by LFYC members. The boat cranes used to transfer sailboats between the lake and their trailers have a two ton capacity. As a result, the LFYC fleet is comprised of sailboats up to 26 feet in length. Popular boats in the LFYC fleet include the Colgate 26, J24, J70, J80, Pearson Ensign, Catalina 22, Rhodes 19, Merit 25 and Flying Scot. Many of these are sailed by veterans of larger boats and more distant harbors. 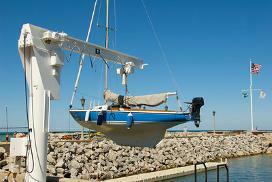 The time required to transfer a sailboat either into or out of the lake generally ranges from 5 to 15 minutes. The proximity of most LFYC members to the harbor and the ability to quickly launch a boat enables members to take advantage of favorable winds. Dry sailing also provides peace of mind when members are not sailing—knowing that their boats are safely on their trailers in a locked compound. Most of the boats are winterized and stored in the compound during the off-season, which allows members to extend the sailing season. Since 2000, LFYC has provided Lake Forest sailors with a voice to the agencies that operate the park and harbor. There is no clubhouse, but the club sponsors racing and social events customary to yacht clubs. LFYC members serve as volunteers for the regattas of Lake Forest Sailing (the Recreation Department's nationally-ranked sail training program that also uses the compound and waterfront). 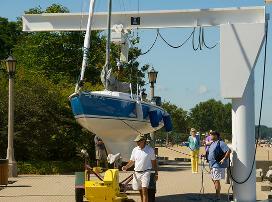 The club maintains a collection of equipment for boat maintenance in outdoor storage boxes that are accessible to members within the compound. Most importantly, LFYC fosters camaraderie amongst those who share a passion for wind and sea.